I’m impressed by how the Timaru community redeems the offenders and victims through the work scheme. 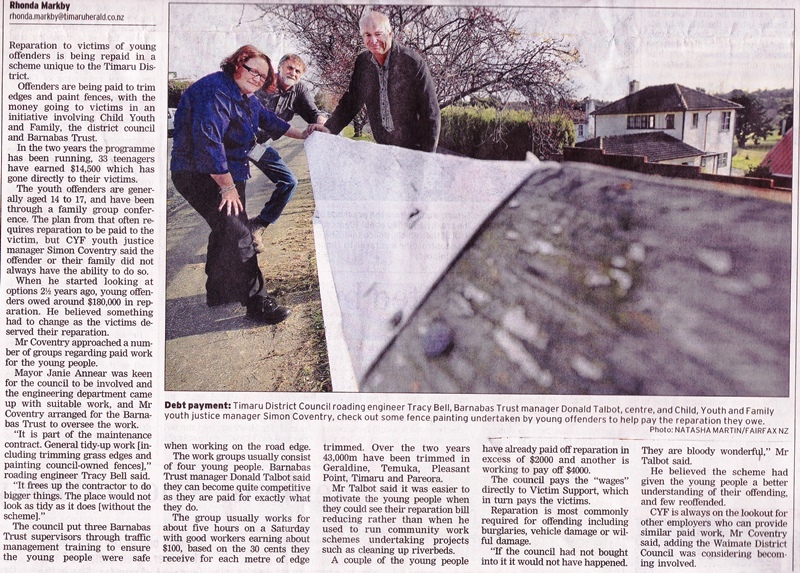 Through joint administration of the Child Youth and Family, Timaru District Council and Barnabas Trust, the teenage offenders get paid doing manual jobs around the community such as trimming edges and painting fences. The money they earned goes to the victims for damages done. Victim Support administers the payment to victims. I believe it’s a tough project to undertake but retribution has very priceless results for offenders, victims and most of all for Timaru community. Please click on the image below to read the full article I scanned from The Timaru Herald. Congratulations to the organisations involved in perpetuating this program. Congratulations Timaru for this noble project! You can read the article on the web too. I agree entirely Jonan. It’s a great project and certainly one of our council initiatives that I’m really proud of. Thank you Steve for taking time to post a comment. It is my hope and prayer that other communities, especially in the Philippines will consider implementing such scheme for betterment of society.